Government - Welcome to Our Generation USA! Click here for a List of the Forms of Government. Government is the system or group of people governing an organized community, often a state. In the case of its broad associative definition, government normally consists of legislature, executive, and judiciary. Government is a means by which state policies are enforced, as well as a mechanism for determining the policy. Each government has a kind of constitution, a statement of its governing principles and philosophy. Typically the philosphy chosen is some balance between the principle of individual freedom and the idea of absolute state authority (tyranny). The main aspect of any philosophy of government is how political power is obtained, with the two main forms being electoral contest and hereditary succession. Superficially, all governments have an official or ideal form. The United States is a constitutional republic, while the former Soviet Union was a socialist republic. However self-identification is not objective, and as Kopstein and Lichbach argue, defining regimes can be tricky. For example, elections are a defining characteristic of an electoral democracy, but in practice elections in the former Soviet Union were not "free and fair" and took place in a one-party state. Voltaire argued that "the Holy Roman Empire is neither Holy, nor Roman, nor an Empire". Many governments that officially call themselves a "democratic republic" are not democratic, nor a republic; they are usually a dictatorship de facto. Communist dictatorships have been especially prone to use this term. For example, the official name of North Vietnam was "The Democratic Republic of Vietnam". China uses a variant, "The People's Republic of China". Thus in many practical classifications it would not be considered democratic. Other complications include general non-consensus or deliberate "distortion or bias" of reasonable technical definitions to political ideologies and associated forms of governing, due to the nature of politics in the modern era. For example: The meaning of "conservatism" in the United States has little in common with the way the word's definition is used elsewhere. As Ribuffo notes, "what Americans now call conservatism much of the world calls liberalism or neoliberalism". Since the 1950s conservatism in the United States has been chiefly associated with the Republican Party. However, during the era of segregation many Southern Democrats were conservatives, and they played a key role in the Conservative Coalition that controlled Congress from 1937 to 1963. Every country in the world is ruled by a system of governance that combines at least three or more political or economic attributes. Additionally, opinions vary by individuals concerning the types and properties of governments that exist. "Shades of gray" are commonplace in any government and its corresponding classification. Even the most liberal democracies limit rival political activity to one extent or another while the most tyrannical dictatorships must organize a broad base of support thereby creating difficulties for "pigeonholing" governments into narrow categories. Examples include the claims of the United States as being a plutocracy rather than a democracy since some American voters believe elections are being manipulated by wealthy Super PACs. Plato also assigns a man to each of these regimes to illustrate what they stand for. The tyrannical man would represent tyranny for example. These five regimes progressively degenerate starting with aristocracy at the top and tyranny at the bottom. The difference of Commonwealths consisteth in the difference of the sovereign, or the person representative of all and every one of the multitude. And because the sovereignty is either in one man, or in an assembly of more than one; and into that assembly either every man hath right to enter, or not every one, but certain men distinguished from the rest; it is manifest there can be but three kinds of Commonwealth. For the representative must needs be one man, or more; and if more, then it is the assembly of all, or but of a part. When the representative is one man, then is the Commonwealth a monarchy; when an assembly of all that will come together, then it is a democracy, or popular Commonwealth; when an assembly of a part only, then it is called an aristocracy. Other kind of Commonwealth there can be none: for either one, or more, or all, must have the sovereign power (which I have shown to be indivisible) entire. A monarchy is where a family or group of families (rarely another type of group), called the royalty, represents national identity, with power traditionally assigned to one of its individuals, called the monarch, who mostly rule kingdoms. The actual role of the monarch and other members of royalty varies from purely symbolical (crowned republic) to partial and restricted (constitutional monarchy) to completely despotic (absolute monarchy). Traditionally and in most cases, the post of the monarch is inherited, but there are also elective monarchies where the monarch is elected. Aristocracy is a form of government that places power in the hands of a small, privileged ruling class. ​An oligarchy is ruled by a small group of segregated, powerful or influential people who usually share similar interests or family relations. These people may spread power and elect candidates equally or not equally. An oligarchy is different from a true democracy because very few people are given the chance to change things. An oligarchy does not have to be hereditary or monarchic. An oligarchy does not have one clear ruler but several rulers. Some historical examples of oligarchy are the former Union of Soviet Socialist Republics. Some critics of representative democracy think of the United States as an oligarchy. The Athenian democracy used sortition to elect candidates, almost always male, Greek, educated citizens holding a minimum of land, wealth and status. A theocracy is rule by a religious elite; a system of governance composed of religious institutions in which the state and the church are traditionally or constitutionally the same entity. The Vatican (see Pope), Iran (see Supreme Leader), Tibetan government (see Dalai Lama), Caliphates and other Islamic states are historically considered theocracies. In a general sense, in a democracy, all the people of a state or polity are involved in making decisions about its affairs. Also refer to the rule by a government chosen by election where most of the populace are enfranchised. The key distinction between a democracy and other forms of constitutional government is usually taken to be that the right to vote is not limited by a person's wealth or race (the main qualification for enfranchisement is usually having reached a certain age). A democratic government is, therefore, one supported (at least at the time of the election) by a majority of the populace (provided the election was held fairly). A "majority" may be defined in different ways. There are many "power-sharing" (usually in countries where people mainly identify themselves by race or religion) or "electoral-college" or "constituency" systems where the government is not chosen by a simple one-vote-per-person headcount. Liberal democracy is a variant of democracy. It is a form of government in which representative democracy operates under the principles of liberalism. It is characterized by fair, free, and competitive elections between multiple distinct political parties, a separation of powers into different branches of government, the rule of law in everyday life as part of an open society, and the protection of human rights and civil liberties for all persons. To define the system in practice, liberal democracies often draw upon a constitution, either formally written or uncodified, to delineate the powers of government and enshrine the social contract. After a period of sustained expansion throughout the 20th century, liberal democracy became the predominant political system in the world. A republic is a form of government in which the country is considered a "public matter" (Latin: res publica), not the private concern or property of the rulers, and where offices of states are subsequently directly or indirectly elected or appointed rather than inherited. The people, or some significant portion of them, have supreme control over the government and where offices of state are elected or chosen by elected people. A common simplified definition of a republic is a government where the head of state is not a monarch. Rule by authoritarian governments is identified in societies where a specific set of people possess the authority of the state in a republic or union. It is a political system controlled by unelected rulers who usually permit some degree of individual freedom. Rule by a totalitarian government is characterized by a highly centralized and coercive authority that regulates nearly every aspect of public and private life. In contrast, a constitutional republic is rule by a government whose powers are limited by law or a formal constitution, and chosen by a vote among at least some sections of the populace (Ancient Sparta was in its own terms a republic, though most inhabitants were disenfranchised). ​Republics that exclude sections of the populace from participation will typically claim to represent all citizens (by defining people without the vote as "non-citizens"). Examples include the United States, South Africa, India, etc. Federalism is a political concept in which a group of members are bound together by covenant (Latin: foedus, covenant) with a governing representative head. The term "federalism" is also used to describe a system of government in which sovereignty is constitutionally divided between a central governing authority and constituent political units (such as states or provinces). ​Federalism is a system based upon democratic rules and institutions in which the power to govern is shared between national and provincial/state governments, creating what is often called a federation. Proponents are often called federalists. Principles: Certain major characteristics are defining of certain types; others are historically associated with certain types of government. Autonomy: This list focuses on differing approaches that political systems take to the distribution of sovereignty, and the autonomy of regions within the state. ​Sovereignty located exclusively at the centre of political jurisdiction. Sovereignty located at the center and in peripheral areas. 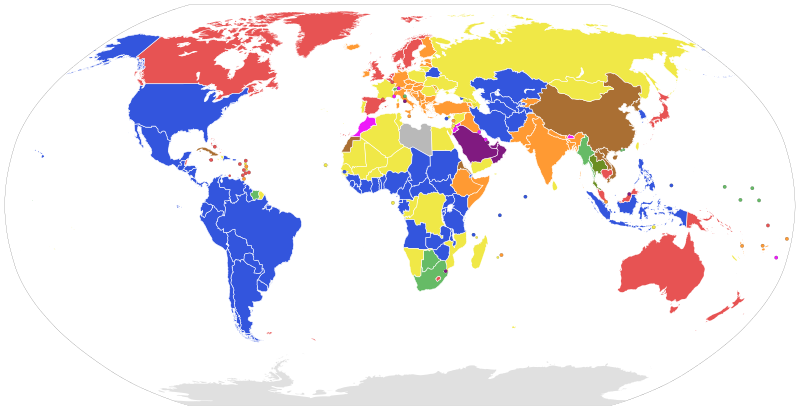 Click here for a List of Countries by System of Government. A government is the system by which a state or community is controlled. In the Commonwealth of Nations, the word government is also used more narrowly to refer to the collective group of people that exercises executive authority in a state, the usage of which is analogous to what is called an "administration" in American English. Furthermore, especially in American English, the concepts of the state and the government may be used synonymously to refer to the person or group of people exercising authority over a politically organized territory. Finally, government is also sometimes used in English as a synonym for governance. ​In political science, it has long been a goal to create a typology or taxonomy of polities, as typologies of political systems are not obvious. It is especially important in the political science fields of comparative politics and international relations. On the surface, identifying a form of government appears to be simple, as all governments have an official form. The United States is a constitutional republic, while the former Soviet Union was a socialist republic. However self-identification is not objective, and as Kopstein and Lichbach argue, defining regimes can be tricky. For example, elections are a defining characteristic of an electoral democracy, but in practice elections in the former Soviet Union were not "free and fair" and took place in a one-party state. Many governments that officially call themselves a "democratic republic" are not democratic, nor a republic; they are usually a dictatorship de facto. Communist dictatorships have been especially prone to use this term. For example, the official name of North Vietnam was "The Democratic Republic of Vietnam." China uses a variant, "The People's Republic of China." Thus in many practical classifications it would not be considered democratic. Identifying a form of government is also difficult because a large number of political systems originate as socio-economic movements and are then carried into governments by specific parties naming themselves after those movements; all with competing political-ideologies. Experience with those movements in power, and the strong ties they may have to particular forms of government, can cause them to be considered as forms of government in themselves. As Ribuffo (2011) notes, "what Americans now call conservatism much of the world calls liberalism or neoliberalism". Since the 1950s conservatism in the United States has been chiefly associated with the Republican Party. However, during the era of segregation many Southern Democrats were conservatives, and they played a key role in the Conservative Coalition that controlled Congress from 1937 to 1963. Researchers from Halmstad University developed a dataset called MaxRange designed to define the level of democracy and institutional structure (its regime-type) on a 100-graded scale where every value represents a unique regimetype. Values are sorted from 1–100 based on level of democracy and political accountability. MaxRange defines the value corresponding to all states and every month from 1789 to the present (continually updated). Every country in the world is ruled by a system of governance that combines at least 3 (or more) political and/or economic attributes. Additionally, opinions vary by individuals concerning the types and properties of governments that exist. "Shades of gray" are commonplace in any government (and its corresponding classification). Even the most liberal democracies limit rival political activity to one extent or another, whilst the most tyrannical dictatorships must organize a broad base of support, thereby creating difficulties for "pigeonholing" governments into narrow categories. Examples include the claims of the United States as being a plutocracy rather than a democracy since some American voters believe elections are being manipulated by wealthy Super PACs. YouTube Video: What is a Sovereign State? ​A sovereign state is a state with borders where people live, and where a government makes laws and talks to other sovereign states. The people have to follow the laws that the government makes. Most sovereign states are recognized which means other sovereign states agree that it's really a sovereign state. Being recognized makes it easier for a sovereign state to talk to and make agreements (treaties) with other sovereign states. There are hundreds of recognized sovereign states today. Sovereignty is a word that is often used wrongly. Lassa Oppenheim said that there is no idea whose meaning is more controversial than sovereignty. No one argues the fact that from the time the idea of sovereignty was first used in political science until now, there has never been one meaning that everyone agreed on. Justice Evatt of the High Court of Australia says that "sovereignty is neither a question of fact, nor a question of law, but a question that does not arise at all." Because the meaning of the words has changed over time and past writers often used the word "state" in a different ways it is difficult to say exactly what a state is. Mikhail Bakunin used the word simply to mean a governing organization. Other writers used the word "state" to mean any law-making or law enforcement agency. Karl Marx said that the state was what was used by the ruling class of a country to control the rule. According to Max Weber, the state is an organization who are the only people allowed to use violence in a particular area. 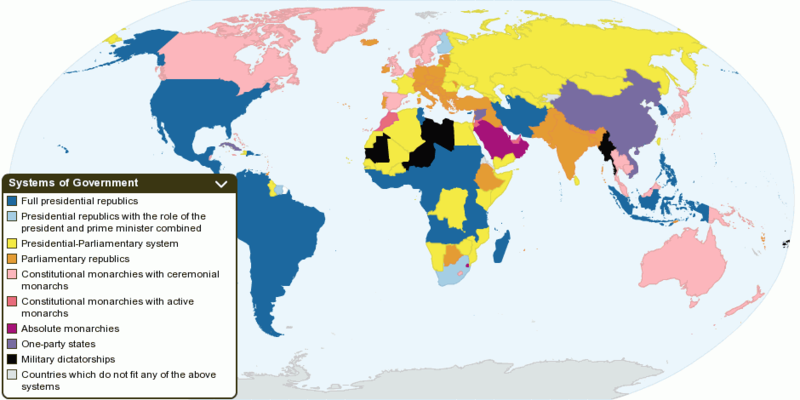 Membership within the United Nations system divides the 206 listed states into three categories: 193 member states, 2 observer states, and 11 other states. The sovereignty dispute column indicates states whose sovereignty is undisputed (191 states) and states whose sovereignty is disputed (15 states, out of which there are 5 member states, 1 observer state and 9 other states). Compiling a list such as this can be a difficult and controversial process, as there is no definition that is binding on all the members of the community of nations concerning the criteria for statehood. For more information on the criteria used to determine the contents of this list, please see the criteria for inclusion section below. The list is intended to include entities that have been recognized to have de facto status as sovereign states, and inclusion should not be seen as an endorsement of any specific claim to statehood in legal terms. Transparency International (TI) has published the Corruption Perceptions Index (CPI) since 1995, annually ranking countries "by their perceived levels of corruption, as determined by expert assessments and opinion surveys." The CPI generally defines corruption as "the misuse of public power for private benefit". Denmark is the least corrupt country in the world, ranking consistently high among international financial transparency, while the most corrupt country in the world is North Korea, remaining on 8 out of 100 since 2012. The 2012 CPI takes into account 16 different surveys and assessments from 12 different institutions. The 13 surveys/assessments are either business people opinion surveys or performance assessments from a group of analysts. Click Here for Rankings, 2012-2016. ​Because corruption is willfully hidden, it is impossible to measure directly; instead, proxies for corruption are used. Seligson states that corruption is a very "difficult phenomenon to measure", there have been many attempts to solve this problem but they’ve all come up with limitations. Corruption is too complex to be captured by a single score. The nature of corruption in rural Kansas will, for instance, be different than in the city administration of New York, yet the Index measures them in the same way. By measuring perceptions of corruption, as opposed to corruption itself, the Index may simply be reinforcing stereotypes and cliches. The Index only measures public-sector corruption, leaving out private actors. This for instance means the Libor scandal or the VW emissions scandal are not counted. Media outlets frequently use the raw numbers as a yardstick for government performance, without clarifying what the numbers mean. The local Transparency International chapter in Bangladesh disowned the index results after a change in methodology caused the country's scores to increase; media reported it as an "improvement". In a 2013 article in Foreign Policy, Alex Cobham suggested that CPI should be dropped for the good of Transparency International. It argues that the CPI embeds a powerful and misleading elite bias in popular perceptions of corruption, potentially contributing to a vicious cycle and at the same time incentivizing inappropriate policy responses. Cobham writes, "the index corrupts perceptions to the extent that it's hard to see a justification for its continuing publication." However, recent econometric analyses that have exploited the existence of natural experiments on the level of corruption and compared the CPI with other subjective indicators have found that, while not perfect, the CPI does appear to consistently and validly measure the magnitude of corruption across the world. In the United States, many lawyers advise international businesses to consult the CPI when attempting to measure the risk of Foreign Corrupt Practices Act violations in different nations. This practice has been criticized by the Minnesota Journal of International Law, which wrote that since the CPI may be subject to perceptual biases it therefore should not be considered by lawyers to be a measure of actual national corruption risk. Transparency International also publishes the Global Corruption Barometer, which ranks countries by corruption levels using direct surveys instead of perceived expert opinions, which has been under criticism for substantial bias from the powerful elite. Transparency International has warned that a country with a clean CPI score may still be linked to corruption internationally. For example, while Sweden had the 3rd best CPI score in 2015, one of its state-owned companies, TeliaSonera, was facing allegations of bribery in Uzbekistan. Transparency International (2010). Corruption Perceptions Index 2010: Long methodological brief (PDF) (Report). Transparency International. Retrieved 24 August 2011. A Users' Guide to Measuring Corruption critiques the CPI and similar indices. The North Atlantic Treaty Organization (NATO), also called the North Atlantic Alliance, is an intergovernmental military alliance between 29 North American and European countries. The alliance is based on the North Atlantic Treaty that was signed on 4 April 1949. NATO constitutes a system of collective defense whereby its independent member states agree to mutual defende in response to an attack by any external party. NATO Headquarters are located in Haren, Brussels, Belgium, while the headquarters of Allied Command Operations is near Mons, Belgium. NATO was little more than a political association until the Korean War galvanized the organization's member states, and an integrated military structure was built up under the direction of two US Supreme Commanders. The course of the Cold War led to a rivalry with nations of the Warsaw Pact which formed in 1955. Doubts over the strength of the relationship between the European states and the United States ebbed and flowed, along with doubts over the credibility of the NATO defense against a prospective Soviet invasion—doubts that led to the development of the independent French nuclear deterrent and the withdrawal of France from NATO's military structure in 1966 for 30 years. After the fall of the Berlin Wall in Germany in 1989, the organization conducted its first military interventions in Bosnia from 1992 to 1995 and later Yugoslavia in 1999 during the breakup of Yugoslavia. Politically, the organization sought better relations with former Warsaw Pact countries, several of which joined the alliance in 1999 and 2004. Article 5 of the North Atlantic treaty, requiring member states to come to the aid of any member state subject to an armed attack, was invoked for the first and only time after the September 11 attacks, after which troops were deployed to Afghanistan under the NATO-led ISAF. The organization has operated a range of additional roles since then, including sending trainers to Iraq, assisting in counter-piracy operations and in 2011 enforcing a no-fly zone over Libya in accordance with UN Security Council Resolution 1973. The less potent Article 4, which merely invokes consultation among NATO members, has been invoked five times following incidents in the Iraq War, Syrian Civil War, and annexation of Crimea. Since its founding, the admission of new member states has increased the alliance from the original 12 countries to 29. The most recent member state to be added to NATO is Montenegro on 5 June 2017. NATO currently recognizes Bosnia and Herzegovina, Georgia, Macedonia and Ukraine as aspiring members. An additional 21 countries participate in NATO's Partnership for Peace program, with 15 other countries involved in institutionalized dialogue programs. The combined military spending of all NATO members constitutes over 70% of the global total. Members' defense spending is supposed to amount to at least 2% of GDP by 2024. Of the 29 member countries, two are located in North America (Canada and the United States) and 27 are European countries while Turkey is in Eurasia. All members have militaries, except for Iceland which does not have a typical army (but does, however, have a coast guard and a small unit of civilian specialists for NATO operations). Three of NATO's members are nuclear weapons states: France, the United Kingdom, and the United States. NATO has 12 original founding member nation states, and from 18 February 1952 to 6 May 1955, it added three more member nations, and a fourth on 30 May 1982. After the end of the Cold War, NATO added 13 more member nations (10 former Warsaw Pact members and three former Yugoslav republics) from 12 March 1999 to 5 June 2017. YouTube Video: What is Representative Democracy? Pictured below: In dark blue, countries designated "electoral democracies" in Freedom House's 2017 survey Freedom in the World, covering the year 2016. Representative democracy (also indirect democracy, representative republic, representative government or psephocracy) is a type of democracy founded on the principle of elected officials representing a group of people, as opposed to direct democracy. Nearly all modern Western-style democracies are types of representative democracies; for example, the United Kingdom is a constitutional monarchy, France is a unitary state, and the United States is a federal republic. It is an element of both the parliamentary and the presidential systems of government and is typically used in a lower chamber such as the House of Commons of the United Kingdom, Lok Sabha of India, and may be curtailed by constitutional constraints such as an upper chamber. It has been described by some political theorists including Robert A. Dahl, Gregory Houston and Ian Liebenberg as polyarchy. In it the power is in the hands of the representatives who are elected by the people. ...it ought to be the happiness and glory of a representative to live in the strictest union, the closest correspondence, and the most unreserved communication with his constituents. Their wishes ought to have great weight with him; their opinion, high respect; their business, un-remitted attention. It is his duty to sacrifice his repose, his pleasures, his satisfactions, to theirs; and above all, ever, and in all cases, to prefer their interest to his own. But his un-biased opinion, his mature judgment, his enlightened conscience, he ought not to sacrifice to you, to any man, or to any set of men living. These he does not derive from your pleasure; no, nor from the law and the constitution. They are a trust from Providence, for the abuse of which he is deeply answerable. Your representative owes you, not his industry only, but his judgment; and he betrays, instead of serving you, if he sacrifices it to your opinion. YouTube Video: How does Switzerland Elect Their Government? Direct democracy or pure democracy is a form of democracy in which people decide on policy initiatives directly. This differs from the majority of most currently established democracies, which are representative democracies (previous topic above). In a representative democracy, people vote for representatives who then enact policy initiatives. In direct democracy, people decide on policies without any intermediary. Depending on the particular system in use, direct democracy might entail passing executive decisions, the use of sortition, making laws, directly electing or dismissing officials, and conducting trials. Two leading forms of direct democracy are participatory democracy and deliberative democracy. Semi-direct democracies in which representatives administer day-to-day governance, but the citizens remain the sovereign, allow for three forms of popular action: referendum (plebiscite), initiative, and recall. The first two forms—referendums and initiatives—are examples of direct legislation. Compulsory referendum subjects the legislation drafted by political elites to a binding popular vote. This is the most common form of direct legislation. Popular referendum empowers citizens to make a petition that calls existing legislation to a vote by the citizens. Power of initiative allows members of the general public to propose specific statutory measures or constitutional reforms to the government and, as with referendums, the vote may be binding or simply advisory. Initiatives may be direct or indirect: With the direct initiative, a successful proposition is placed directly on the ballot to be subject to vote (as exemplified by California's system). With an indirect initiative, a successful proposition is first presented to the legislature for their consideration; however, if no acceptable action is taken after a designated period of time, the proposition moves to direct popular vote. Such a form of indirect initiative is utilized by Switzerland for constitutional amendments. Power of recall gives the public the power to remove elected officials from office before the end of their term. Reform of the United Nations: United Nations Parliamentary Assembly, direct elected parliamentarians instead of administrations' diplomaticians and United Nations Secretary-General elect by popular vote. The Federal Council is the seven-member executive council which constitutes the federal government of the Swiss Confederation and serves as the collective executive head of government and state of Switzerland. While the entire council is responsible for leading the federal administration of Switzerland, each Councillor heads one of the seven federal executive departments. The position of Federal President rotates among the seven Councillors on a yearly basis, with the year's Vice President becoming next year's President. Alain Berset is the incumbent president of the council since 1 January 2018. A federation (also known as a federal state) is a political entity characterized by a union of partially self-governing provinces, states, or other regions under a central (federal) government. In a federation, the self-governing status of the component states, as well as the division of power between them and the central government, is typically constitutionally entrenched and may not be altered by a unilateral decision of either party, the states or the federal political body. Alternatively, federation is a form of government in which sovereign power is formally divided between a central authority and a number of constituent regions so that each region retains some degree of control over its internal affairs. The governmental or constitutional structure found in a federation is considered to be federalist, or to be an example of federalism. It can be considered the opposite of another system, the unitary state. France, for example, has been unitary for multiple centuries. Austria and its Bundesländer was a unitary state with administrative divisions that became federated through the implementation of the Austrian Constitution following the 1918 collapse of Austria-Hungary. Germany, with its 16 states or Bundesländer, is an example of a federation. Federations are often multiethnic and cover a large area of territory (such as Russia, the United States, Canada, India, or Brazil), but neither is necessarily the case. The initial agreements create a stability that encourages other common interests, reduces differences between the disparate territories, and gives them all even more common ground. At some time, that is recognized and a movement is organized to merge more closely. At other times, especially when common cultural factors are at play such as ethnicity and language, some of the steps in this pattern are expedited and compressed. Several ancient chiefdoms and kingdoms, such as the 4th-century BCE League of Corinth, Noricum in Central Europe, and the Haudenosaunee Confederation in pre-Columbian North America, could be described as federations or confederations. The Old Swiss Confederacy was an early example of formal non-unitary statehood. Several colonies and dominions in the New World consisted of autonomous provinces, transformed to federal states upon independence (see Spanish American wars of independence). The oldest continuous federation, and a role model for many subsequent federations, is the United States. Some of the New World federations failed; the Federal Republic of Central America broke up into independent states less than 20 years after its founding. Others, such as Argentina and Mexico, have shifted between federal, confederal, and unitary systems, before settling into federalism. Brazil became a federation only after the fall of the monarchy (see States of Brazil), and Venezuela became a federation after the Federal War. Australia and Canada are also federations. Fiji and New Zealand were originally part of this process, but they decided not to join the federation. 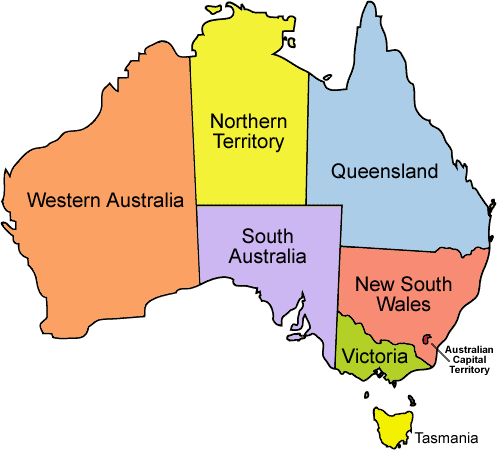 Following federation, the six colonies that united to form the Commonwealth of Australia as states kept the systems of government (and the bicameral legislatures) that they had developed as separate colonies, but they also agreed to have a federal government that was responsible for matters concerning the whole nation. The efforts to bring about federation in the mid-19th century were dogged by the lack of popular support for the movement. A number of conventions were held during the 1890s to develop a constitution for the Commonwealth. Sir Henry Parkes, Premier of New South Wales, was instrumental in this process. Sir Edmund Barton, second only to Parkes in the length of his commitment to the federation cause, was the caretaker Prime Minister of Australia at the inaugural national election in 1901 in March 1901. The election returned Barton as prime minister, though without a majority. This period has lent its name to an architectural style prevalent in Australia at that time, known as Federation architecture, or Federation style. YouTube Video: What is UNITARY STATE? ​​A unitary state is a state governed as a single power in which the central government is ultimately supreme and any administrative divisions (sub-national units) exercise only the powers that the central government chooses to delegate. The majority of states in the world have a unitary system of government. Of the 193 UN member states, 165 are governed as unitary states. In a unitary state, sub-national units are created and abolished (an example being the 22 mainland regions of France being merged into 13), and their powers may be broadened and narrowed, by the central government. Although political power may be delegated through devolution to local governments by statute, the central government remains supreme; it may abrogate the acts of devolved governments or curtail their powers. The United Kingdom of Great Britain and Northern Ireland is an example of a unitary state. Scotland, Wales and Northern Ireland have a degree of autonomous devolved power, but such power is delegated by the Parliament of the United Kingdom, which may enact laws unilaterally altering or abolishing devolution (England does not have any devolved power). Many unitary states have no areas possessing a degree of autonomy. In such countries, sub-national regions cannot decide their own laws. Examples are the Republic of Ireland and the Kingdom of Norway. Unitary states are contrasted with federations, or federal states. In such states, the sub-national governments share powers with the central government as equal actors through a written constitution, to which the consent of both is required to make amendments. This means that the sub-national units have a right of existence and powers that cannot be unilaterally changed by the central government. Bolivia's multiparty democracy has seen a wide variety of parties in the presidency and parliament, although the Revolutionary Nationalist Movement, Nationalist Democratic Action, and the Revolutionary Left Movement predominated from 1985 to 2005. The current president is Evo Morales, the first indigenous Bolivian to serve as head of state. Morales' Movement for Socialism – Political Instrument for the Sovereignty of the Peoples party was the first to win an outright presidential majority in four decades, doing so both in 2005 and 2009. The constitution, drafted in 2006–07 and approved in 2009, provides for balanced executive, legislative, judicial, and electoral powers, as well as several levels of autonomy. The traditionally strong executive branch tends to overshadow the Congress, whose role is generally limited to debating and approving legislation initiated by the executive. The judiciary, consisting of the Supreme Court and departmental and lower courts, has long been riddled with corruption and inefficiency. Through revisions to the constitution in 1994, and subsequent laws, the government has initiated potentially far-reaching reforms in the judicial system as well as increasing decentralizing powers to departments, municipalities, and indigenous territories. The executive branch is headed by a President and Vice President, and consists of a variable number (currently, 20) of government ministries. The president is elected to a five-year term by popular vote, and governs from the Presidential Palace (popularly called the Burnt Palace, Palacio Quemado) in La Paz. In the case that no candidate receives an absolute majority of the popular vote or more than 40% of the vote with an advantage of more than 10% over the second-place finisher, a run-off is to be held among the two candidates most voted. The Asamblea Legislativa Plurinacional (Plurinational Legislative Assembly or National Congress) has two chambers. The Cámara de Diputados (Chamber of Deputies) has 130 members elected to five-year terms, seventy from single-member districts (circunscripciones), sixty by proportional representation, and seven by the minority indigenous peoples of seven departments. The Cámara de Senadores (Chamber of Senators) has 36 members (four per department). Members of the Assembly are elected to five-year terms. The body has its headquarters on the Plaza Murillo in La Paz, but also holds honorary sessions elsewhere in Bolivia. The Vice President serves as titular head of the combined Assembly. Bolivia held its first judicial elections to choose members of the national courts by popular vote, a reform brought about by Evo Morales. The Plurinational Electoral Organ is an independent branch of government which replaced the National Electoral Court in 2010. The branch consists of the Supreme Electoral Tribunal, the nine Departmental Electoral Tribunals, Electoral Judges, the anonymously selected Juries at Election Tables, and Electoral Notaries. Wilfredo Ovando presides over the seven-member Supreme Electoral Tribunal. Its operations are mandated by the Constitution and regulated by the Electoral Regime Law (Law 026, passed 2010). The Organ's first elections were the country's first judicial election in October 2011, and five municipal special elections held in 2011. Elections may fill offices in the legislature, sometimes in the executive and judiciary, and for regional and local government. This process is also used in many other private and business organizations, from clubs to voluntary associations and corporations. The universal use of elections as a tool for selecting representatives in modern representative democracies is in contrast with the practice in the democratic archetype, ancient Athens, where the Elections were considered an oligarchic institution and most political offices were filled using sortition, also known as allotment, by which officeholders were chosen by lot. ​​An electoral system is a set of rules that determine how elections and referendums are conducted and how their results are determined. Political electoral systems are organized by governments, while non-political elections may take place in business, non-profit organisations and informal organisations. Some electoral systems elect a single winner to a unique position, such as prime minister, president or governor, while others elect multiple winners, such as members of parliament or boards of directors. There are a large number of variations in electoral systems, but the most common systems are first-past-the-post voting, the two-round (runoff) system, proportional representation and ranked or preferential voting. Some electoral systems, such as mixed systems, attempt to combine the benefits of non-proportional and proportional systems. The study of formally defined electoral methods is called social choice theory or voting theory, and this study can take place within the field of political science, economics, or mathematics, and specifically within the subfields of game theory and mechanism design. Impossibility proofs such as Arrow's impossibility theorem demonstrates that when voters have three or more alternatives, it is not possible to design a ranked voting electoral system that reflects the preferences of individuals in a global preference of the community, present in countries with proportional representation and plurality voting.